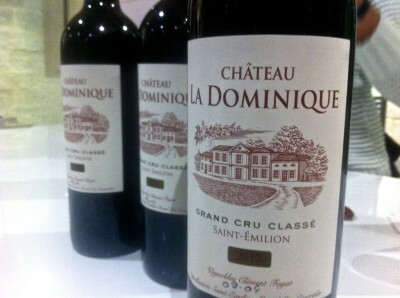 Château La Dominique produces rich St Emilion in a modern style. Vineyard/Terroir: 23 hectares, 25% of which are on deep gravel, and 75% on gravel soils with a clay base. Double sorting of the grapes, in the vineyard and in the winery. Planted with 80% Merlot, 12% Cabernet Franc and 2% Cabernet Sauvignon. Winemaking/Elevage: 22 small stainless steel fermenters to vinify parcel by parcel. 15-18 months in oak, between 50-70% new each vintage. Second wine Saint Paul de Dominique. Classified a Grand Cru. 2009 Very deep and saturated look; spicy plum tones with some earthy development; attractive to me; very saturated and full on the palate but not leaden and plodding. Nice sap and not cloying. Freshness alongside the depth and extract. Very good handling of the vintage. Drink now -2030. 93 MW Institute Nov ’13 [Earlier note] Dense and arterial; earthy, initially some bottle stink that blew off; ripe notes but not jammy; lots of depth and chew with minerality; nice palate with earthy notes alongside the fruit; lots of tannin here but very ripe, but gives the wine density and chew on the finish. Very good effort. 93+/100 UGC Oct ’11 [Earlier] Dense and tight to the rim; briary nose; little reductive note; lots of fruit though; strawberry and red fruits beneath. Some wet stone and minerals; palate big and bold; tannic at this stage; beetroot note, should settle; lots of extract and tannin again. Long haul wine. [later] Very sturdy; massively extracted though. So difficult to judge. 90-92?/100 but only if tannins settle?